New York — Shutting down the Hudson River Tunnels to repair the damage caused by Superstorm Sandy without having new tunnels already built would have far-reaching consequences across many sectors of the regional and national economy, according to a new report by civic organization Regional Plan Association and Arup, a multinational professional services firm. The report, A Preventable Crisis: The Economic and Human Costs of a Hudson River Rail Tunnel Shutdown (http://library.rpa.org/pdf/RPA-HRT_Impact_Study_20190225.pdf), details the human and economic toll of a partial Hudson River Tunnel shutdown without the alternative that a new, fully-funded Gateway project would provide. A partial shutdown of the tunnels would mean dramatically expanded commute and travel times and increased congestion on public transportation and already stressed roadways and airports, leading to increased business and consumer costs, job loss, home devaluation, and health risks. Effects of a four year shutdown would cost the national economy $16 billion, $1.5 billion in federal tax revenue, and $1 billion in state tax revenue outside of New York and Jersey. 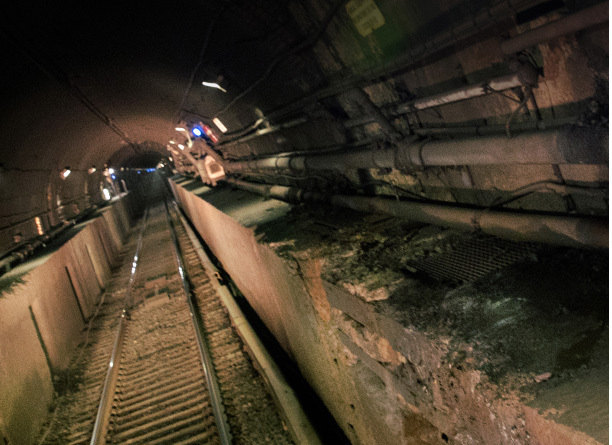 More than 200,000 trips are taken through the existing Hudson River tunnel on a daily basis in as many as 450 trains. Rail travel below the Hudson between New Jersey and New York is already unreliable due to the tunnel’s advanced age and the extensive damage sustained during Superstorm Sandy; the tunnel will soon reach the end of its useful life. In order to repair the existing tunnel, the two tubes would need to be closed one by one, reducing the number of trains going in and out of Penn Station by as much as 75%. The Gateway project would build a new tunnel underneath the Hudson River before undergoing any work on the original tunnel to mitigate service reduction. While funds for the Gateway project were promised by the previous federal administration, the outlook for Gateway now looks increasingly uncertain with changing federal priorities. Meanwhile, the tunnel tubes continue to deteriorate. Without the added resource of the Gateway tunnel, emergency work on the Trans-Hudson tunnel would mean that nearly half a million people would have longer, less reliable and more crowded commutes, losing hours of productive, personal and family time and putting jobs at risk. The report also details the impact that repair of the Trans-Hudson tunnel, if needed before new rail capacity is built, would have on a variety of people and businesses. 38,000 NJTransit riders would be unable to ride the train, forcing them into a variety of less-desirable options to get to and from work. Thousands of workers would eventually be forced to move or accept lower paying jobs closer to home. Almost a quarter million drivers will have longer trips to work; more than half of these drivers would experience delays of a half-hour or more. An additional 170,000 riders would have longer rides on the PATH train or bus. Many commuters would need to add additional buffer time to their commutes, meaning less time for family and other priorities. The shutdown would cost the national economy $16 billion over four years. More than half of this cost would be the result of increased work inefficiencies due to longer commutes. These wage costs alone equate to the loss of 33,000 jobs per year. Forcing more than 10,000 drivers onto the roads would result in 38,000 additional car crashes that would result in thousands of injuries and 90-100 preventable deaths. Transportation is nodal; other forms of transit malfunctions or shutdowns would have a compounding effect on people’s ability to get around regionally. Every time PATH, the Port Authority Bus Terminal, the New York City subway, northeast airports or interstate highways experience shutdowns or delays, it would become even harder to get around regionally. Homeowners would see their property values dip by a collective $22 billion. Owners of commercial property—offices, stores, health and education facilities, factories and warehouses—would also see a decline in property values. $7 billion would be lost in Federal, state, and local tax revenue; including $1.5 billion in federal taxes and over $1 billion in states outside of New York and New Jersey. Many displaced long-range Amtrak riders would fly instead, increasing DC to NYC air fares by as much as 65% and pricing out many leisure, small business and non-profit travelers. Truck delays would cost the Northeast economy close to a billion dollars. “A Preventable Crisis” builds upon RPA’s Fourth Regional Plan, released in 2017, recommending new rail tunnels under the Hudson and East Rivers.